2510. 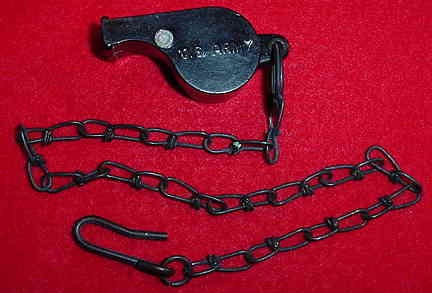 Original Vintage U.S. Army Whistle with Chain and Hook. 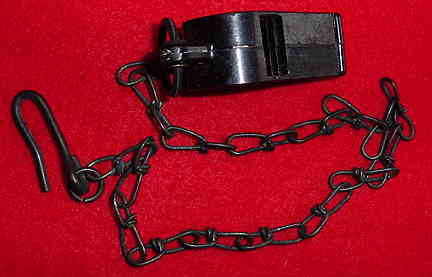 This is an extremely fine vintage black whistle marked "U.S. Army" and having a black-finished chain with end hook. I'm not sure when this whistle was manufactured or used. Our price...$25. 1650. Original "Veterans of World War I U.S.A." 6th National Convention Badge. This is an interesting and historic badge for the 6th National Convention of this WWI veterans' organization that was held in Springfield, Illinois on September 14-17, 1958. The ribbon is similar to the WWI Victory Medal ribbon. The long brass badge body features maker's markings on the reverse side. Our price...$20.